Once we begin to expand into new territories, we need to really do our due diligence to understand the local communities, traditions, business practices, and hierarchy. We need to position our leaders, based on the needs of businesses in outside cultures. Keeping our teams integrated by hiring locals will eliminate much of our burdens in the marketplace. Keeping our teams happy will build trust in nearby territories. Together, we can position our brand for greatness and eliminate cultural discrepancies in the process. 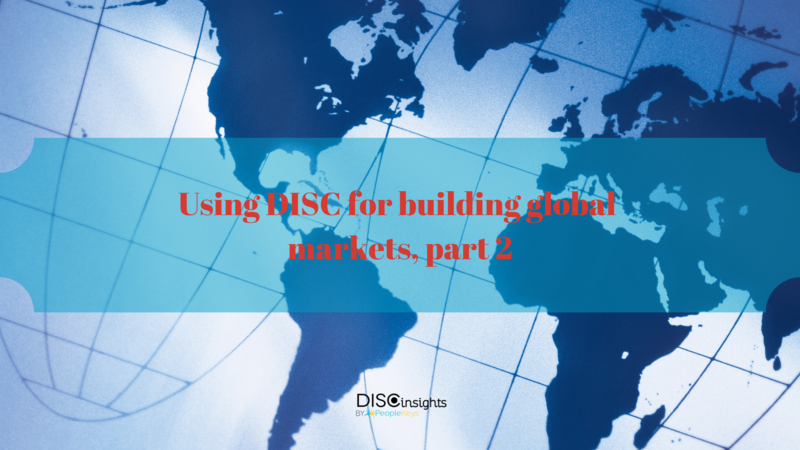 In Part 1, we discussed why DISC theory is important to globalization and gave few tips and tricks for teambuilding & interaction with “the locals,” and here we will continue to dig further in utilizing DISC in your global expansion. How do we implement DISC into our plans for globalization and interaction with outside cultures? Our teams will benefit by hiring an “I”-type personality in the transition of establishing business. We need a spokesperson – a liaison with local communities. We need someone who understands people and who can address the needs of local cultures, values, and expectations, therein. Values are ever-changing and constant communication with the community is more than necessary in continually meeting customer-related needs. A “C” style member of the team can help us to evaluate our presence within the community, including rates of adoption and areas in which we are most accepted. Where is the most demand for our products and/or services? “C”-types will do their due diligence and tell us where we are lacking, which initiatives are most effective and how well our sales are doing in comparison to local competitors and area powerhouses. Because much of this still relates to the community in which we serve, teaming up “I” and “C”-types will help us find the best results and ensure a prosperous future, thereafter. The style blend that combines I and C is called Assessor - famous for being observant to details and the unique value of people. Charles R. Darwin and Bill Gates are some of the well-known representatives of this style blend. Strategic Partnerships, Pricing and Vendor Negotiations. Once we begin our expansion, we will need someone who can be a bit more aggressive, stand on solid ground and make decisions at the drop of a dime. This person will need to be somewhat power-hungry and able to negotiate. This person will draw lines, set boundaries and take a stand for our brand’s future. Does this description ring a bell? A “D" style could now enter, stand firm and make sure the deal goes through with expectation. If a “C” and an “I” were to team up in the acquisition of new partners, vendors and shareholders, the outcome would be a slam-dunk and a classic case of “good cop, bad cop” with satisfactory results across the board. The “I” would strengthen the cause by opening doors and winning the favor of outside partners, and with the “C’s" ability to compile the numbers, the team would have all the tools necessary to ultimately break through barriers of culture and entry. Nonetheless, we still need additional elements to make sure an “S” would be able to pull everyone together and keep the team bond strong. Partnering with outside organizations will help us to more quickly enter into new markets and gain the trust of local communities (see “Build strategic partnerships in 2019 with DISC”). Partnering with existing businesses, including distributors and retail locations, will allow us to enter markets with competitive pricing and maximize our profits from the beginning. Negotiating with vendors will allow us to cut costs throughout operations while allowing us to operate in that country, thereby eliminating some costs for import/export, including taxes and tariffs, as well as on manufacturing. Another plus side of local vendorship is that much of the production will already be set to code and in compliance with ongoing regulations. A “C” type personality will verify those compliances and make sure all agreements are under “lock and key.” The “S” type, on the other hand, will take administrative charge and ensure stability in every partnership and vendor agreement. They will also make sure that we are upholding our end of all service-level agreements (SLAs) so that we continue to satisfy our clients, partners and stakeholder interests. In essence, you can have one type without the other. However, without the right mix, we aren’t going to reach our full potential and may not necessarily reach our ultimate success. Read more about understanding local laws, traditions, regulations, and compliances, and why slang, perception, and use of language is of key importance in part 3.